Thank you for your interest in our Gulf Shores, AL law firm. Our lawyers at Link & Smith, P.C. have devoted their practice to assisting persons that have been injured through the negligence of others. We handle personal injury claims arising from serious car wrecks, tractor trailer wrecks, premises liability claims, DUI related injuries, & boating/Jet Ski accidents. Over the years we have successfully handled wrongful death and catastrophic injury cases from the settlement stage to the trial and appellate levels. We serve clients across the Southeast including Gulf Shores, Al. If you or someone you love is the victim of an accident and suffered injuries in Gulf Shores, Al., you need to contact a personal injury lawyer immediately. Link & Smith, P.C. has experience dealing with injury claims resulting from all types of accidents. Some of these accidents include: automobile, truck, tractor-trailer, motorcycle, premises liability, slip and falls, DUI, texting while driving, and animal attacks. We also specialize in accidents resulting in traumatic brain injury (TBI), catastrophic injury, and wrongful death. Link & Smith, P.C. has been helping accident victims since 1991 and will work to get you the maximum settlement for your injuries. An injury will impact your life in a number of ways; along with the pain and suffering, you can also experience loss of wages and loss of abilities. If you have been injured, our qualified personal injury lawyers will work to ensure you receive the proper compensation for your injury. 1. Contact the police to make sure a police report is filed. This report will be critical to your case. Give the officer all the information you can. Make sure you do not admit fault or make any comments about the accident. 2. Take photos of the accident scene. Document your injuries both in photos and in writing. Keep a journal of what you have experienced following your accident and keep track of wages you have lost due to inability to work. 3. Talk to any witnesses at the scene. Get their contact information and record their statements. 4. 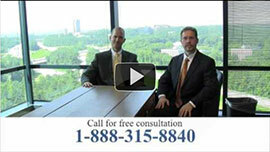 Call a personal injury lawyer. You should do this before speaking to anyone from an insurance agency. Your lawyer will work to make sure you are compensated, while an insurance representative will be more concerned with paying the smallest claim possible. 5. Make an insurance claim – but only through your personal injury lawyer. Your lawyer will make sure you do not settle for less than your accident is worth.